Engineered wood flooring provides a durable wooden floor solution that is easy to care for. Our high quality and cheap engineered flooring comes in a variety of wood grains and finishes, including brushed oiled, stained colours and lacquered finishes too. Browse our collection below or read on for more information, such as engineered wood maintenance and installation tips. Engineered floor consists of plywood which is topped with a layer of real wood. This uses less wood when compared to a plank of solid wood flooring, making engineered wood cheaper and more environmentally friendly. Because of its top layer, engineered wood floor is the closest to solid wood flooring. So, it can create a timeless look in any home or office, without the hefty price tag. On top of this, it’s easier to maintain than a solid wood floor and is suitable to be placed in most rooms, except bathrooms or rooms with high moisture levels. 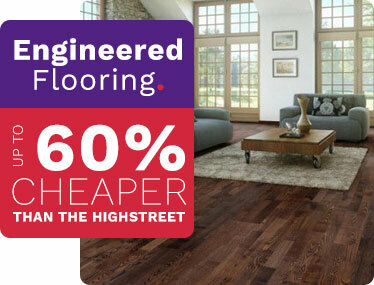 It’s a fantastic solution for living room flooring as it gives the effect of solid wood but without the upkeep. This means if you have children or pets, your floorboards are still safe. Because this type of flooring contains plywood, engineered wooden flooring prices are significantly cheaper than solid wood flooring. Also, because the floor offers more durability than solid wood, you know you’re getting the best value for your money. Some of the cheapest engineered wood flooring deals can be found online, so you’ve come to the right place. Do I Need Underlay for Engineered Wood? Underlay is a sheet of insulation which goes between your new floorboards and the subfloor of the room. Engineered wood is usually a floating floor; this means the floorboards attach to each other instead of being stuck to the floor. For this reason, underlay is recommended when installing an engineered wood floor. This will help soundproof the room and give your engineered flooring a little more longevity. If your subfloor is concrete, ensure you get an underlay with a moisture barrier to keep your floor warm and dry at all times. Read our engineered flooring Underlay Guide for more information. Installing engineered floor is surprisingly easy to do yourself. Start by gathering your materials, including your pack of engineered wood, your chosen underlay, scissors, tape, a hammer and nails, and finally beading for the perimeter of the room. First ensure your subfloor is clean and dry, then lay the underlay. Do this by placing the sheets of underlay side by side and simply taping them together. Trim when you get to the edges of the room until the underlay provides a flat layer which covers the floor. Then start placing your floorboards from the corner of the room. Engineering wood floor is specially cut for easy installation. It features a click joint system, so you can fit each plank into place without the use of glue. When placing the floorboards, ensure you leave a 10mm expansion gap around the edge of the room to allow space for beading. Finally, add your beading to the expansion using your hammer and nails. Engineered wood flooring is easy to clean. Simply use a damp cloth or mop to pick up any dirt. However, ensure you dry the floor afterwards. While engineered wood is more water resistant than solid wood flooring, it shouldn’t ever be completely wet. If your engineered wood floor undergoes notable damage, you can easily fix the plank in question without replacing your floor. Do this by sanding away any stains and then refinishing the floor with lacquer or oil. As we have such wide variety of different brands and types of engineered wood flooring, it can be a little difficult to find the best style for your home. If you have any further questions about engineered wood floor, then please don’t hesitate to contact one of our flooring experts on 0330 100 00 15. What Tools Do I Need To Lay Engineered Wood Flooring? What is the Best Engineered Wood Flooring?